The Jawbreaker Sunglasses by Oakley are the pinnacle of the Oakley Performance Collection. These frames are for those who are athletes, specifically designed for cycling and sports that include water. Oakley enlarged the upper peripheral region of the lenses in order to extend its field of vision and make these sunglasses optimal for cycling. Switchlock™ Technology makes it easy to extend or shorten the temples, making them helmet adjustable. Sunglasses are at the level of ANSI Z87.1 regarding impact resistance. 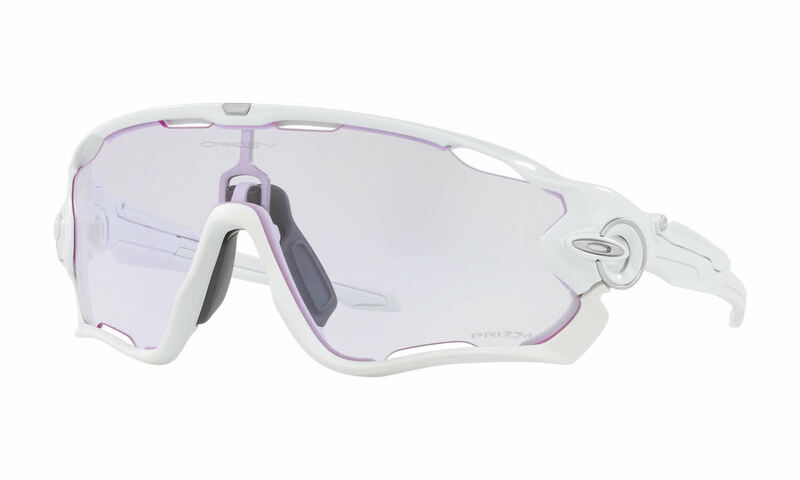 Oakley Jawbreaker features a Full Rim frame front. Unobtainium® is a material of the frame which increases its grip when it comes into contact with water or sweat giving the wearer a secure fit. Prizm™ technology fine tunes colors in order to optimize vision in low or intense lighting. The Jawbreaker is available in an Alternate Fit which is preferred by those with higher cheekbones and a wider nose bridge. Made of O Matter which is an Oakley material that is lightweight and flexible. Jawbreaker Sunglasses feature a Wrap Around shape that protects peripheral vision. Frame front is emphasized with a Saddle Bridge, which distributes weight more evenly on the face, making the frames more sturdy and slip-resistant. Signature Oakley O logo can be found on both temples. Unobtainium earsocks protect ears from water and wind. Available with a mirror coating option on certain colors which filters backlight in intense light. Available with polarized lenses on certain colors which greatly reduce glare. Jawbreaker Sunglasses are available with prescription lenses here. Jawbreaker Sunglasses come with Oakley carrying case and cleaning cloth. The Mark Cavendish Oakley Jawbreakers Are Amazing, in fact I have 3 pair of Jawbreakers by far my favorite sunglasses for Cycling. These fit really great. I love the red color and the lenses. The sunglasses fit nice and snug. They don't get foggy like my wrap around ones. These keep the sun out just like wrap around ones I own. These are just as described and not my first buy from Frames Direct. They deliver them in perfect condition just like my past purchases. I'll buy from them again and you should too! I love these glasses, they seem to be the perfect fit for me! These sunglasses are so comfortable I just love wearing them all the time.